Remember Me takes place in Neo-Paris circa 2084 where you take on the role of protagonist and memory hunter Nilin, an Errorist that has been imprisoned and awaits memory deletion through a systematization known as Memorize. It isn’t until you hear the sweet voice of a guardian angel through an unknown comm device that you manage to escape out of the Bastille Fortress where you are being held, and the story begins to unfold. This is the type of game that presented itself as something new and mysterious prior to release. In fact it was somewhat of a mystery that presented dynamic art, a unique protagonist, and the promise of a memorable story. Where it fell short was in living up to the expectation of something greater, which in the defense of Capcom was hyped up falsely due to the lack of information. What we are left with is a game that is beyond beautiful, with droll and expected gameplay mechanics, and a story that cries for more. The majority of the game plays like a linear version of Assassin’s Creed, blended with Mirror’s Edge and the combat style of Batman: Arkham Asylum. 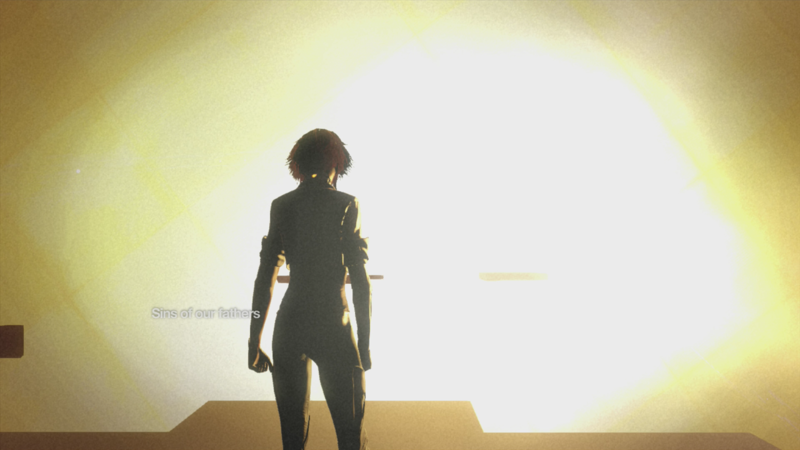 The story plays out through a series of (mostly) indoor cyberpunk environments that have the player running, jumping and climbing through obstacles which are either vividly pointed out (through bright orange arrows) or highlighting of certain bars (similar to Mirror’s Edge). While the mechanics are smooth and the direction is straightforward, it lacks the risk-reward system due to how unlikely it is to actually “miss” a jump. Through the entire game, I fell twice, and that was only because I was searching for unlockables. Meanwhile, the combat falls into the now-staple mechanics made famous by the Arkham series, with it’s own unique twist. The standard combat consists of sequencing two buttons (X and Y on the Xbox 360 controller), and using one button to dodge/evade (B). When an enemy has the marker over their head it’s a signal that they are about to attack, encouraging you to dodge or lose your chain of attacks. Fortunately the attack chains do present a unique touch to an aging mechanic, in which you’re given the ability to structure the combo attacks to your own personal taste. There are four types of attacks that fall into the following categories; Damage, healing, cooldown reduction, and chains. While the sequence of attacks are predetermined, you can decide how to combine the attacks to best fit your play style. You can have one sequence be all-healing, all-damage, or you can mix and match to do damage, then heal, and then damage again. There is some player choice there, but not as much as you’re led to believe. One of the most memorable experiences in the game come into play when you open your eyes and take a good look at the environments. 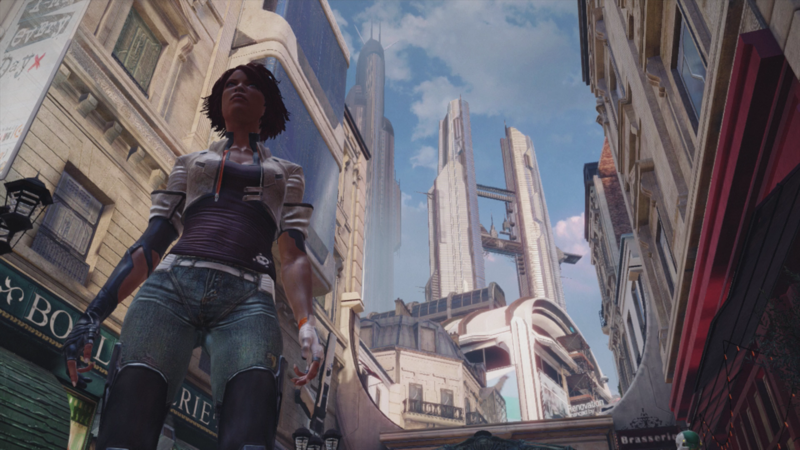 The background images, the city in the distance, and the engagement with the nuances of futuristic living (such as humanoid robots running through the street with shopping bags, or droids sweeping the street). These all give the player the impression that they are truly walking through the future. The abundant use of orange infuses the game with an energetic and exciting experience that is intended to engage the player into the surroundings. It’s the art-style that originally sold the title because words were unnecessary to express the beauty it was attempting to portray. Visually, the title beyond stellar. Mechanically the game is sound. There is very little interfering with the fluidity of the combat mechanics, the action sequences or the motion. In addition to the visual effects of the game and the mechanical fluidity, there’s an element that is often ignored that this title hits spot-on. The original soundtrack and the voice acting. The voice acting for Nilin is performed by Kezia Burrows, who played the role of Dr. Cath Llewellyn in Crash. While some of the original lines were criticized during presentations, the polish that resulted from the finished product was engaging and relatable. More important than the voice acting, arguably, was the original soundtrack by Olivier Deriviere which can be heard through Spotify here. This is the type of game that encourages mixed criticism and caters to a very particular crowd. There is something unique in this game that triggers a psychological stimulation in the concept of memory manipulation. If we look beyond the game and think about the preconceived notions of how sacred we hold our personal memories to be, then imagine a world in which our thoughts can become as public as our Facebook status updates or tweets, it becomes a terrifying concept. The implications of memory manipulation stem beyond our interpersonal relationships, just imagine the sanctity with which we hold them. It is said that our individual humanity is a product of our memory, and that when this memory is lost, so is our individuality. This game questions that humanity through memory. While Remember Me isn’t the most memorable experience, and has limited to no replayability, it does stimulate some thought into the concept that was formed around the transfer, storage and various uses of memory. 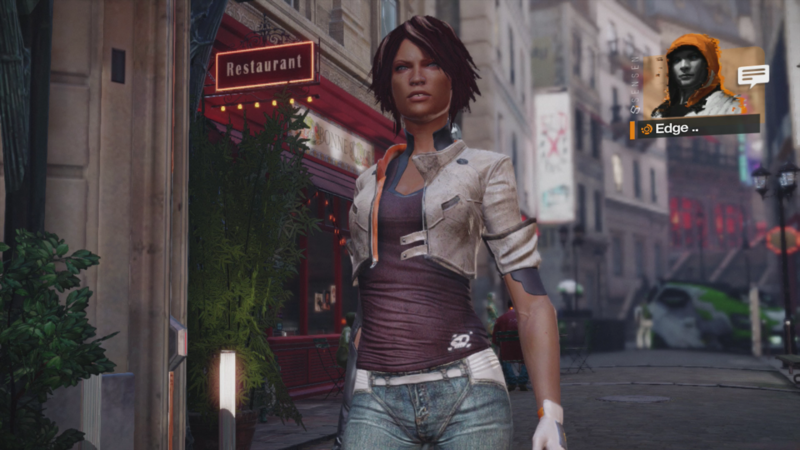 I suspect this is not the last we will see of Nilin, or the Remember Me concept. But it will take a big step to get there.